Can I fetch Fetid Pools using Evolving Wilds ? First off Taplands are going to hurt every deck so cut at least 2 Crypt of Agadeem , 4 Fetid Pools , maybe 1 Dakmor Salvage , and 2 Watery Grave (you shouldn't need that many). Add 4 Polluted Delta and basic lands. Also Bitter Ordeal isn't that great honestly unless built around. 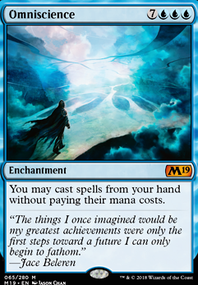 The first time I saw it I thought I could just do a ton of self-milling with it, but the permanents need to enter the graveyard from the battlefield (which makes it useless unless built around even in a very graveyard oriented deck). 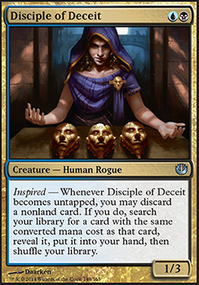 Also I would add 4 Damping Sphere to the sideboard, it 100% turns off Tron and Storm and slows other decks down. Finlly Sinister Concoction is a cool card, but seems too slow. I would recommend cutting it for 4 Fatal Push . 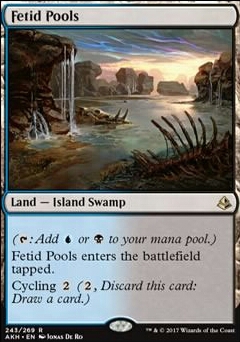 Aye, I would swap out either Bojuka Bog or Fetid Pools . 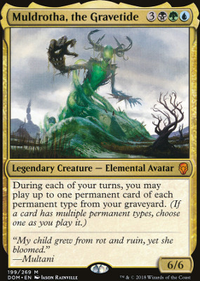 Bojuka is a slow swamp with a one time effect and isn't all that worth it unless your meta runs a lot of grave recursion, and you have plenty of draw spells to need a tap/cycle land. Well, it's commander, so it's slow and you can use lands that enter tapped and are budget friendly. Dismal Backwater , Dimir Aqueduct , Dimir Guildgate , Submerged Boneyard , Jwar Isle Refuge , Frost Marsh and Salt Marsh are budget. Fetid Pools , Underground River , and Sunken Hollow are also good options. Check out http://managathering.com/duallands/Dimir.html for more options. As for mana rocks. You'll need them. Commander always needs them. I like Worn Powerstone , Thran Dynamo , Hedron Archive , Everflowing Chalice , and Astral Cornucopia . Dimir Signet is really good. I gotta say that you need a Rise of the Dark Realms . It's a bomb. Your deck has some requirements, so you should only run nonbasic lands and mana rocks that can add somehow. Some cheap suggestions are: Reliquary Tower , Unclaimed Territory (I see you have a lot of wizards), Exotic Orchard (usually tap for all your colors), Darkwater Catacombs , Sunken Hollow , Shivan Reef , Underground River , Fetid Pools , Temple of Epiphany , Temple of Deceit instead of Crypt of the Eternals , Rupture Spire , Vivid Crag , Vivid Marsh , Temple of the False God and some basic lands. 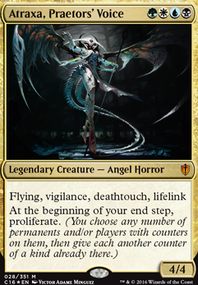 // Unstable Obelisk is really expensive for what it does - Reality Shift do the job cheaply. Archaeomancer is great for recursion.